Do Nintendo's Presidents Have Crappy Handwriting? Or Should We Blame the 3DS? Satoru Iwata, Nintendo's president, wears spiffy banker suits. He has floppy hair. His glasses are nice. But how's his handwriting? On a 3DS? Above is the Swapnote message Nintendo is sending out for its monthly "Nintendo Direct" online presentation in which Iwata and Nintendo directly speak to the internet. The message is fairly simple: "Hello. This is Iwata from Nintendo! This is a notice for the next Nintendo Direct. Feb. 22nd, from 8pm. Please watch it." The individual who posted these images on 2channel stated this shows everyone just how difficult it is to use the touch pen, taking into account the tiny touch pen and small screen. "For the president of a large international company, this is embarrassing," the uploader wrote. 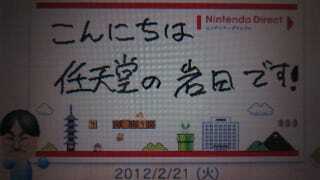 Other commenters in the thread were less fussed about the touch pen and Iwata's handwriting. Since calligraphy is held in such high regard and the written Japanese language is beautiful, people in Japan might be more sensitive to things like handwriting. But everyone already knows what kind of penmanship is possible on a touchscreen. Me? I think it's pretty cool Iwata handwrote this notice. Crappy handwriting, touch pen shortcomings, or whatever, it's a nice personal touch. And it's not just Iwata—Kotaku reader Jon sent along a handwritten Swapnote from Nintendo of America president Reggie Fils-Aime. Like Iwata, his handwriting might be considered cruddy!